I was about 9 years old, growing up in our house on North 34th Street, a grade-schooler at Dean Highland Elementary. One day in August after torrential rains, we heard incredible news: The Brazos had risen 41 feet. 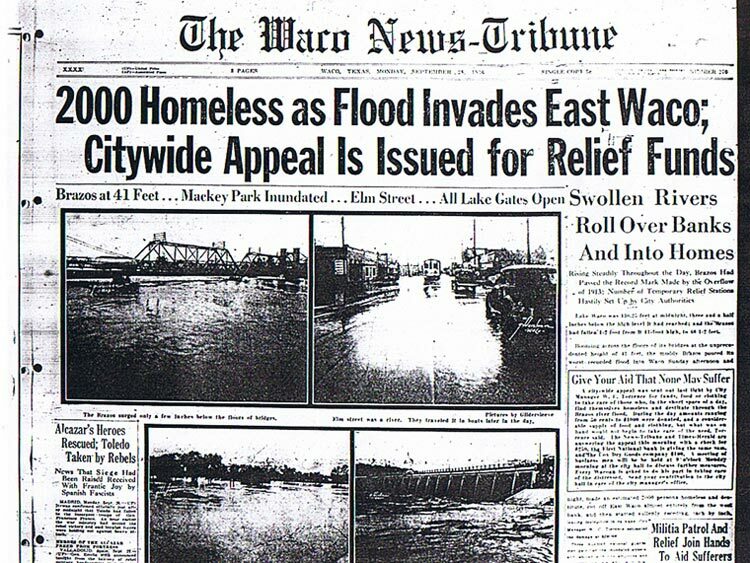 Much of East Waco was under water. We got in the family automobile, a 1936 black Chevrolet touring car. My father drove us to a spot on Washington Avenue on the west side of the river where we could see this amazing sight. Mackey Park and Elm Street were both under water. The news would report that over 2000 people were homeless. At this time, businesses were all around the square, as well as up and down Elm Avenue. While the flood didn't touch the square, it left Elm submerged. I viewed the devastation from where the Convention Center on Washington Avenue. Over the years, the Brazos River has seen its share of floods, but the flood of 1936 surpassed all, even the terrible flood of 1913. Seeing the water only a few inches below the floor of the Washington Avenue Bridge and the Suspenion Bridge, and people paddling around in boats on Elm Street, was an awesome sight. I still remember how swiftly the floodwater was moving. 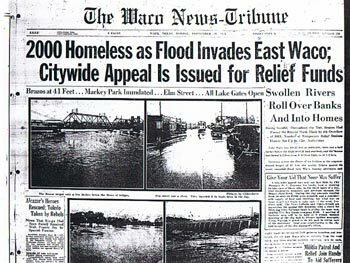 City Manager H.C. Torrence appealed to Waco citizens for donations to help flood victims and had proclaimed martial law. Among other things, the Waco Times Herald reported that businessman Albert Lacy Clifton was marooned overnight at Clifton Manufacturing Plant. Though Waco has had other major floods, particularly along Waco Creek, the completion of Whitney Dam in the early 1940s provided relief from the flooding of the Brazos, and confidence that East Waco will never be so unindated again. Broadcast pioneer Goodson McKee was a fixture on WACO radio and statewide radio broadcasts.